BOSTON – The Yarmouth-Dennis contingent took in the view from atop the Green Monster, and five Brewster players watched batting practice from three rows behind home plate. A handful of Falmouth Commodores stretched out in blue seats in the grandstand down the left-field line, and the all-stars from Hyannis managed to get their photos taken with David Ortiz and Trot Nixon next to the Red Sox dugout. 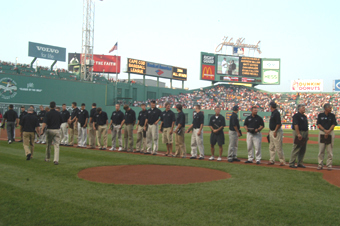 The general public wouldn’t enter Fenway Park for another hour, but some of the best amateur baseball players in the country took full advantage of a unique opportunity to experience one of baseball’s most storied fields. As has become annual tradition, the Boston Red Sox honored the Cape Cod Baseball League’s all-stars before Wednesday’s game against Baltimore. Former Hyannis catcher Doug Mirabelli presented plaques to each player in a short ceremony behind home plate. Even for players whose feats on Cape League diamonds has propelled them closer than ever to living their dreams, the experience felt slightly surreal. Hyannis pitcher Joe Martinez had been to Fenway Park before, had even pitched on the historic mound while wearing a Boston College uniform. But when he walked out on the grass to receive his congratulatory plaque in front of a sell-out crowd, the sensation was different. Falmouth third baseman Matt Antonelli likewise had walked on the Fenway Park grass before, but his previous experience came with a group of Babe Ruth baseball players. But even if the recognition was new for the Peabody native, the visions of himself playing on the field certainly weren’t. After the obligatory photo in front of the Green Monster early in the afternoon, catcher Frank Curreri and his Yarmouth-Dennis teammates immediately climbed atop the Green Monster to experience the unique vantage point. The Y-D group watched batting practice from those seats, and pitcher Justin Blaine nearly caught a blast off the bat of Baltimore shortstop Miguel Tejada. The ball bounced off his hands and went over the fence onto Landsdowne Street. And like any New Englander in his place would, Curreri couldn’t help but picture himself in uniform on the field instead of watching the players from the bleachers.